Chennai: In a case, that questioned the fact whether leaving an instrument inside the patient during a surgical operation amounts to medical negligence or not, the North Chennai District Consumer Disputes Redressal forum was recently seen absolving an orthopedician in one such case. This came after the doctor submitted series of medical literature that pointed out that during surgical procedures breakage of instruments periodically occurs and additional surgical trauma in order to remove the fragment of broken instrument is unjustifiable. The case is that of a patient who had come under the care of .Dr.Sudhakar Williams and Dr.Rangarajan Memorial Hospital after meeting with a road accident in 2009 where he sustained injuries and fractures in both the hands. The doctor at the hospital diagnosed that he sustained fracture on the right elbow along with other injuries and on 23.04.2009, the 2 Opposite Party doctor conducted surgery by fixing k-wire. The patient was discharged a few days later. In 2012, patient went to see a private doctor complaining pain in the hand The Complainant approached and consulted with private doctor, then they advised the Complainant to take x-ray for right elbow with forearm AP & LAT view. As per advice the Complainant took the x-ray and the report of the Gemini Lab and advanced MRI & CT scan report which revealed portions of drill bit. He he underwent surgery at Billroth Hospital where the subject drill bit and also “K” wire was taken out in the right elbow of the Complainant. The doctor and the hospital in their defense stated that proper medical attention and care was rendered to the patient and he was treated according to the acceptable medical standards. They submitted of series of medical literature in respect to Drill bit failure without implant involvement – an intraoperative complication in Orthopedic surgery and literature in respect of Frequency of Instrument Breakage During Orthopedic Procedures and Its Effects on Patients, arguing that therefore the presence of drill bit in no way affected the health of the Complainant and further while conducting the surgery implant, the doctor had followed the procedures established under the medical jurisprudence and since the Complainant health no way affected and from the literature quoted above, the Opposite Parties have not committed any deficiency in service and prays to dismiss the Complaint. From the forgoing literature, it is clear that during surgical procedures breakage of instruments periodically occurs and additional surgical trauma in order to remove the fragment of broken instrument is unjustifiable. 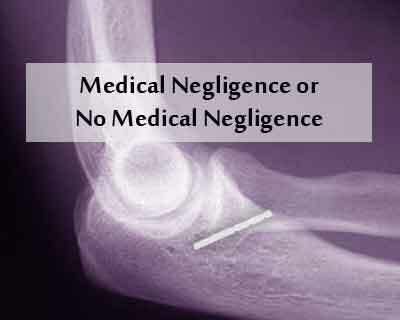 Therefore, in the case in hand also the drill bit left in the right hand of the Complainant at the time of surgery was not removed and hence an another surgery is not justified at the same time. Further, the Complainant has not proved that the 2 Opposite Party nd doctor who conducted operation negligently left the drill bit and further the said drill bit had not caused any ill health or suffering to the Complainant. Therefore, in view of the forgoing discussions we hold that the Opposite Parties have not committed any intentional negligent act and hence it is held that the Opposite Parties 1 & 2 have not committed any deficiency in service. Since the Opposite Parties have not committed any deficiency in service, the complainant is not entitled for any relief as prayed in the complaint and the complaint is liable to be dismissed. That is all fine but what about the disclosure – do u not tell the patient what has happened. Totally unacceptable. that\’s right, informing the patient of any intra-operative complication, however insignificant, is important. To err is human but to hide is cheating. this proves, honest communication with patient is always fruitful.